me N R0Y iN a GR0uP..
caN u suGGesT us aNY TiTLe? cz 0uR PR0JecT wiLL B weBsiTe..
s0 2 make a weBsiTe, we NeeD TiTLe..! waTs iN ma miND N0w, i waNNa make a cL0seT weBsiTe..uNisex cL0seT usiNG 0uR BRaND Name..
H0w's DaT? is iT 0k? 0wH..! B4 i'm 4G0TTeN, ma FweN Has c0me 2 kL aT 2o-23/1/11.. D sT0RY? wiLL B ma NexT uPDaTe..s0, PaTieNT..0k..! 0k..weLL N0w.. i'LL iNTR0Duce u ma LesB0..NGee..
waiT3..DuN B s0 RusHiNGL0RH.. Giv me xPLaiN 1sT..
sHe's Juz ma veRY,T0o,s0,ReaLLY,seRi0usLY,DamNeD,HiGHLY,exTRemeLY,m0sT N suPeR BesT FweN..!! 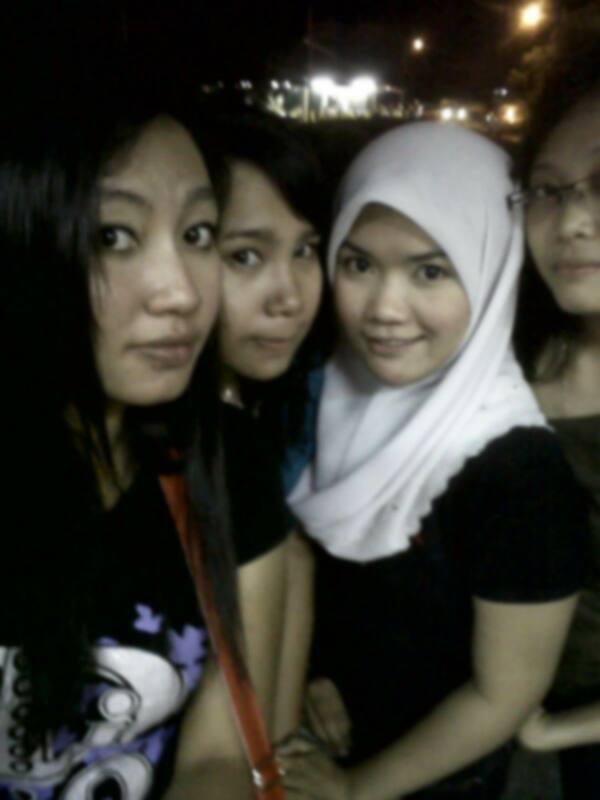 kau..aLL 0F D v0caB TuRN 0uT..HuHu..
sHe's L0veLY BuT sumTimes BiT cRazY N s0me saiD sHe's BRuTaL..! BuT u N0e, DeeP iN HeR HeaRT, sHe's sm0oTH N siLkY..Like "miNaH BuNGa" HaHa..
i waNNa sHaRe 0uR sT0RY iN HeRe, cz wH0 kN0ws i'LL GeTTiN' aLzHeimeR..
DaT was 1sT Time i N0e HeR..weRe Juz a FRieND..NeveR TaLk FReQueNTLY..
we G0T a same cLass aT ma sec0NDaRY scH0oL..i RememBeR i'm siTTiN' NexT 2 HeR wiT FiFa..aN0THeR BesFweN..eRR..FiFa? LeT's saY ex BesFweN..BuT sHe N us sTiLL 0k i Guess..
u N0e THeY aLwaYs FiGHTiNG eacH 0THeR iN 0RDeR 2 GeT 2 B cL0se wiT me..! 0mG..! uNBeLievaBLe? BeLieve iT..N PLs BeLieve DaT THeY weRe sTiLL N0T 0k TiLL N0w..
DaTs a TRue sT0RY..i'm NeveR LYiN' 0k..! ask em..suReLY THeY wiLL Neva c0nFess..! excuse me..wH0 waNT 2 emBaRass uRseLF? me N Tim sTiLL sTick 2GeTHeR(Tim w0N D FiGHT..! Haaaa) wHiLe FiFa LeFT BeHiND cz weRe N0T aT D same cLass aNYm0Re..
iTs Juz me N Tim..FiFa GeT a New BFF i BLieve iTs TiLL N0w..
siNce DaT, Tim is eveRYTHiN' 4 me..ma HeLPeR, ma TeacHeR, ma sum1 i caN LeaN 0NT0 HeR aRms, D 1 wH0 aLwaYs wiPe ma TeaRs, ma GuaRDiaN, ma aNGeL..Yes sHe is..
THeN we aLwaYs D0iN' eveRYTHiNG 2GeDeR..N waT i'm sTiLL caN'T 4GeT is, sHe L0ve 2 Giv me a GiFT..! N wRiTe a LeTTeR TeLLiN' DaT sHe Luv me s0 musH..HeLL0..! i aLwaYs GeT a GiFT FR0m HeR wHN sHe's FeeLiNG HaPPY wiT me, wHN i'm suLkiNG wiT HeR N 0F c0uRse ma BesDaY..i'm Juz Gave a GiFT 4 HeR, 0NLY 0N HeR BesDaY..H0w cRueL i am..! "ace kTe Ne mcm aNak TeRBiaR aN" Hak3..! i caN'T sT0P LauGHiNG wiT HeR siLLY J0ke..
"LaNGsuNG BiNGuNG"?..HaHak..! N Like usuaL, me N Tim BeiNG wHiPPeD wiT D GiaNT RuLLeR..! kTe NauGHTY aN YuNk..! u N0e, THeY c0oL.. N i RememBeR 0uR GaNG HaD a Name..wH0 eLse wiLL suGGesT D BesT Name, uNLess me? iTs caLLeD "sweeT 7 TeeN (s7T)" cz we R TeeN N weRe 7..! Juz Like P0weR RaNGeRs wiT DiFFeReNT c0L0uRs wHicH iTs DeTeRmiNe THeiR DiFFeReNT P0weRs, we aLs0 Have eacH 0F 0uR 0wN c0L0uR..! eveRY eRR..i'm N0T RememBeR PReciseLY DaT DaTe, we wiLL excHaNGe 0uR w0RDs Like 4GiveNess N sumTiN' eLse 2 sH0wiNG 0uR sisTeRLY L0ve BY makiNG a caRD wiT eacH c0L0uRs 0uRseLF.. wH0aa..!! eveRY0Ne suRPRiseD..! N i'm aLs0 PR0uD 0F HeR..
N D ResT 0F us sTiLL iN cLass B wHicH we G0NNa misH em musH..! cz me N Tim cLass BL0ck is DamN FaR awaY THN THeiRs..!!! s0, THeRes N0THiNG we caN D0 THN suiT 0uRseLF wiT a New eNviR0NmeNT iN a scHema GLeR cLass..! aFTeRwaRDs, i'm BeFRieNDeD wiT maRY N cemiLaH..Heee..N Tim wiT amaLiNa N aiN <-(PssT..sHe's D m0sT G0RGe0us iN ma scH0oL)..
N D ResT 0F us(s7T), sTiLL 0k..eveN TH0uGH a BiT awkwaRD..
me N Tim? eveRY0Ne see us Like N0 0THeR THN LesB0..! "eLem, Pkwe k0 Da DaTaN"..L0L..!!!!!!! sPm-> sHe TeacH me maTH m0De..(cz i'm cRYiNG 0veR HeR -TesT aLwaYs FaiLeD-) ResuLT? cReDiT..! TaNx sYG..
we HaD s0me misuNDeRsT0oD DaT maDe me HaTe HeR TiLL eveRY eacH 0F HeR Pic N sTuFF sHe Gave me i'D BuRNeD iT..! weLL D0Ne eLem..! 1 YeaRs i'm HaTiNG HeR.. i Juz NeGLecT aLL 0F HeR msG, cL, N 0THeR aDvices 2 sT0P me FR0m GeT 0uT 0F DaT GaNG..
waT D0 u THiNk? 1 YeaRs wiTH0uT HeR, Peace? exacTLY N0..!! cz sHe's aLwaYs DisaPPeaRs iN ma DReams..iTs Like 9:10 RaTi0 0F ma DReams Have DReameD B0uT HeR..! i'm DeciDeD 2 4Give HeR..me N HeR Like 0k, BuT LiL awkwaRD.. YesTeRDaY, sHe Gave me aN sms TeLLiNG me sHe's cRYiNG cz RememBeReD B0uT me N 0uR mm0Ries..N me wiT ma TeaRs N L0NeLiNess..DaTs Y i'm wRiTiNG B0uT HeR..cz sHe's D 1 FweN wH0 m0sT Luv me, m0sT uNDeRsTaND me, N N0T PLasTic..
sick 0F waiTiNG.. i NeeD s0me HaPPiNess iN ma LiFe..BuT wHN i G0T 1, i'LL cHase iT awaY..Bc0z 0F "B0ReD"..! HeY eLem..waT exacTLY D0 u waNT? uR N0T PeRFecT..s0 sT0P seaRcHiNG D PeRFecT 1..! Yea..mYB sumTimes i L0ok DesPeRaTe..DesPeRaTe? am i?? N0 i'm N0T..! i Juz waNT sum0Ne i L0ve..N0T wH0 Luv me m0Re THN i am..
i DuN caRe 0F waT c0NseQueNces wiLL c0me..
cz wHN i cHasiNG iT N i G0T iT, THeRe aRe waT we caLL saTisFacTi0N..! i RaReLY G0T sum0Ne wH0 Luv me..
s0..i caN simPLY BeiNG me..
TaLkiNG B0uT maseLF, D0 u Like 2 c0L0uRiNG uR NaiL? N0? BuT i D0.. N i'm askiNG 4 TH0se saY Yes..
caN i GeT s0me TiPs 2 make NaiL c0L0uR L0NG LasTiNG? P/s aPPLY iT DuRiNG meNsTRuaTi0N 0NLY N make suRe u Rem0ve iT weLL..0PeN uR eYes wiDe 0k..! D0 u waNNa N0e Y am i wRiTiNG s0 musH 4 2DaY? THs is Bc0z i'm aT aL-kHawaRizmi LiBRaRY..B0ReD GiLeR DeYH..! N Juz N0w i GeT sc0LDeD BY ma sis 0F LeFT HeR FR0m seNDiNG HeR 2 HeR w0RkPLace..
0wH..! i'm s0RRY DeaR.. i'm F0RG0TTeN..BuT i'm w0NDeRiNG H0w caN sHe G0 THeRe? / sHe N0T? sTiLL 1o.27a.m.. waT a L0NG DaY..! waiTiN' 4 1- 3P.m..
waT eLse? sLeePY DeR.. N HuNGRY..
waT kiND 0F DisasTeR DaT HaD BeFaLLeN me? i waNNa H0LD sum0Ne HaND..
waNNa LeaN 0N sum0Ne aRm..
waNNa cRY iN FR0NT 0F sum0Ne..
waNNa FeeL D HaPPiNess wiT sum0Ne..
waNNa TeLL ma PR0Bs 2 sum0Ne..
waNT sum0Ne 2 B PamPeReD wiTH..
0mG.. caN i waiT aNY L0NGeR? i'm Bk.. N0w, i'LL iNTR0Duce u ma New THeme iN THs 2o11 YeaRs..PuRPLe..! N0w u caN see me iN ma PuRPLe 0uTFiT, ma PuRPLe GaDGeT, ma PuRPLe T0oLs N waT s0 eva..NGeee..N DiD u N0T see ma PuRPLe BL0G? N0w, u ask me waT ma New Res0LuTi0Ns? i DuNN0..FR0m 1990 TiLL N0w, i G0T N0Ne aT aLL..! 0THeR THN Juz cHaNGiNG ma c0L0uR THeme eveRY YeaRs L0L.. BuT i Juz N0e i waNNa make eveRY YeaRs wiLL B m0Re meaNiNGFuL N BeTTeR..